Four head cappers are designed to have four cap-tightening chucks integrated into a single machine. Four head cappers transfer containers from a conveyor onto the outer circumference of a rotating disc. The four chucks are positioned to contact the containers as they rotate around the circumference of the disc and apply and tighten caps to the containers. Once the container reaches the other side of the rotating disc, the container is discharged onto a takeaway conveyor. 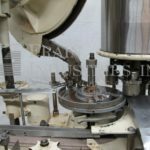 The four chucks on a four head capper allow the capper to have four containers in different stages of the capping operation at once. Specifications- Automatic, Chuck, Heads 4, Container diameter 0" to 4.5", Capsize 0mm to 89mm: Capable of speeds from 40 to 120 cpm – speeds depedning on materials and application. Unit comes with a 104" L x 3 1/4" W delron conveyor with a floor clearance of 32". stainless steel, cleated cap feeder has 32" wide x 38" long x 30" deep stainless steel cap hopper and 16" wide x 130" long belt conveyor with 1" high cleats set on 6" centers and 125" discharge height into the capper feed chute with top motor drive. Mounted on base frame with leveling legs. Stainless steel, 3 head rotary capper capable of speeds from 40 up to 105 cpm. Cap range from 15-63mm. Container size range: dia of 85mm (3-3/8) & max ht of 250 (10"). Equipped with screw in feed to star wheel, 3-1/2” wide conveyor with variable speed controls. Screw feed left to right product flow. Available at an additional cost model ECT cap feeder /hopper, 8” (W) x 2 1/2” (H) cleated cap elevator set on 5” centers. Specifications- Automatic, Chuck, Heads 4, Container diameter 0" to 4.5", Capsize up to 120 mm: Capable of speeds from 40 to 120 cpm – speeds depending on materials and application. Has chucks on 6" centers and is complete with 10′ L x 3 1/4" W delron chain conveyor, worm screw infeed, 11" dia starwheel container handling & independently driven cap sorter. 1 hr changeover ideal for high speed production on small to medium container sizes. Set on 43mm. Consoilidated Model CF4, automatic, 4-head rotary, chuck capper, with cap sorter and feeder, rated from 40 to 120 containers per minute – depending on materials and application. Maximum cap size: 70mm, Maximum container height: 9". Equipped with integrated cap feeder and hopper, disc unscrambler, cap chute and button, 142" long x 2-1/4" wide belt conveyor with star wheel in feed and discharge, no container / no cap and (4) chuck cap heads set on 9" centers with double grip container handling. Controls with cap sorter, capper, turret drive, sorter and machine on / off, push button controls and mounted on heavy duty base frame. Consolidated Model D-4, automatic, 2 head rotary, chuck capper rated from 10 to 60 containers per minute – depending on materials and application. Cap size range: up to 89mm. Container size range: up to 6-1/2" in Diameter; and up to 12" in Height with proper change parts. Equipped with 96" long x 3-1/4" wide Delrin belt conveyor, 24" worm screw to star wheel in feed / discharge, 24 diameter cap sorting wheel with hopper. Controller with machine start / e-stop, jog, cap feed / cap supply controls and mounted on heavy duty base frame. 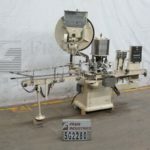 New England Model NERCCE, 4 head, stainless steel, rotary chuck capper and Model NES 36 cap feeder and bowl sorter with speeds – depending on number of heads, container size and configuration. Cap size range: 15mm to 70mm, container size range: 2" to 5" in diameter; 4" to14" in height with proper change parts. Equipped with 44" long x 2-1/4" wide product conveyor with Urethane coated container handling surfaces for gentle handling of containers and is constructed of non marring HDPE (change part per application). 24" rotary turret with 4 servo driven pneumatic chuck capper heads set on 15" centers and collet pull pins for quick release / change over adaptable to a wide variety of caps / containers and has electronic torque control for consistent applied torque of +/- 1.5 in per lb. Control panel with A/B controller with panel view and speed controllers, interlock safety guarding. Mounted on stainless steel base frame. NES 36 stainless steel cap feeder and sorter has 30" long x 27" wide x 26" deep cap hopper and 55" long x 10" wide flexlink conveyor belt with 3-1/2′ high cleats on 10" centers and 36" OD stainless steel sorting bowl. 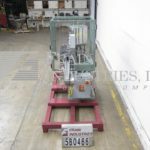 New England Model NERCCE, 4 head, stainless steel, rotary chuck capper and Model NES 36 cap feeder and bowl sorter with speeds – depending on number of heads, container size and configuration. Cap size range: 15mm to 70mm, container size range: 2" to 5" in diameter; 4" to14" in height with proper change parts. Equipped with 44" long x 2-1/4" wide product conveyor with Urethane coated container handling surfaces for gentle handling of containers and is constructed of non marring HDPE (change part per application). 24" rotary turret with 4 servo driven pneumatic chuck capper heads set on 15" centers and collet pull pins for quick release / change over adaptable to a wide variety of caps / containers and has electronic torque control for consistent applied torque of +/- 1.5 in per lb. Control panel with A/B controller with panel view and speed controllers, interlock safety guarding. Mounted on stainless steel base frame. NES 36 stainless steel cap feeder and sorter has 30" long x 27" wide x 26" deep cap hopper and 55" long x 10" wide flexlink conveyor belt with 3-1/2′ high cleats on 10" centers and 36" OD stainless steel sorting bowl. 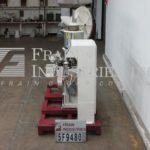 Consoilidated Model CF4, automatic, 4-head rotary, chuck capper, with cap sorter and feeder, rated from 40 to 120 containers per minute – depending on materials and application. Maximum cap size: 70mm, Maximum container height: 9". Equipped with integrated cap feeder and hopper, with disc unscrambler cap chute and button, 85" long x 2-1/2" wide belt conveyor with star wheel in feed and discharge, no container / no cap and (4) torque open chuck cap heads set on 9" centers with double grip container handling. Control panel has CPU controller with cap sorter, capper and turret speed controls, sorter and machine manual, on / off, automatic switch. 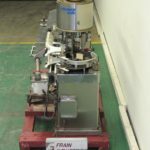 Fowler / Zalkin Model CA4PM, automatic, 4 head stainless steel, small footprint otary screw capper rated from 40 to 200 containers per minute – depending on materials and application. Cap size range: 15mm to 43mm, Container size up to: 3" in Diameter; up to 5" in Height with proper change parts. Equipped with 76" long x 3-1/4” wide plastic Delrin belt conveyor with worm screw to star wheel in feed and discharge 22" diameter stainless steel cap bowl feeder, cap chute, cap button and cap head, stainless steel inclined cap feeder, (4) frictionless, magnetic clutch capping heads, with missing cap and container detection. Remote control panel has A/B PLC with on machine controller, safety light curtains, statis light and mounted on all stainless steel base frame. Capable of running both plastic and glass containers with proper change parts.